When was the radio sold? What did it sell for when new? What is the current used market value? Where was the radio made? What modes does it receive? Is the frequency display analog or digital? If a digital display, what is its resolution? What voltages (or batteries) are required? What accessories were made for it? How was the receiver rated? Receivers built in the last twenty years are solid state. Solid state means the circuit is composed of transistors and integrated circuits rather than vacuum tubes. The problems of tube aging, such as heat and wear, are not a factor with solid state sets. In fact, most solid state receivers work as well five or ten years after they were made as the day they came out of the factory. A rating of 1 to 5 stars for the model as a value on the used market. HHHHH Excellent HHHH Very Good HHH Good HH Fair H Poor. Please note that this is a value rating, not an absolute rating. The used price shown is for a typical working unit in good condition with manual. (Prices realized on ebay are typically higher). These informational listings do not represent an offer to buy or an offer to sell. Values, ratings and specifications are subject to change. While every precaution has been taken in the preparation of this material, the originator assumes no responsibility for omissions or errors. No liability is assumed with respect to the use of the information herein. We hope you find this information useful. If you would like this material in a handy book form then we recommend . 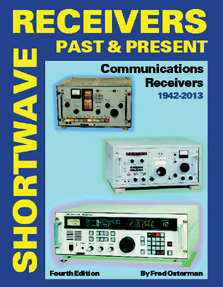 . .
A comprehensive guide to over 1700 shortwave, amateur and commercial communications receivers (plus 1200 variants) manufactured produced in the last 70 years. With 1800 photos and information including: coverage, circuit type, display, features, performance, new & used values (for most), reviews, etc. Over 360 domestic and international manufacturers are represented. Become an instant receiver expert. Fourth Edition. ©2014 Hard bound 800 pages. Buying a used shortwave radio can provide great savings if you have the facts. This affordable market guide features the top 100 most sought after portables and tabletops produced in the last 20 years. Photo, specs, features, ratings, plus new and used values for each. Fourth Edition. ©1998 Universal Radio Research. 78 pages.